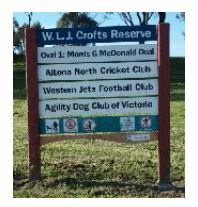 WLJ CROFTS RESERVE is located in Blackshaws Road, Altona North, just east of Grieve Parade and south of Westgate Freeway. In a ceremony on Sunday, 19 December 1976 the reserve was officially opened by the Honourable Alexander Wilson Knight, MLC Melbourne West Province, when the mayor Cr Les Crofts outlined the history leading up to the day’s event and mayoress June Crofts unveiled the commemorative plaque. The reserve covers an area of 29 acres and was purchased by City of Altona council in 1966 at a cost of $102,775. Subsequently, four acres was severed from the main reserve when Westgate Freeway was built. Altona City Council named the reserve after its senior councillor, Cr WLJ Crofts, JP, in recognition of his service to the municipality. Cr WLJ Crofts [William Leslie Joseph Crofts, always known as Les] JP, AMTC, FIBF was born in Orbost, Victoria and moved to Williamstown in 1936. With relatives in Altona, he visited the area frequently and finally moved to the area in 1949. Even in those days Altona was still a small town. The first Presbyterian Church service was held at his home at 70 Civic Parade and in 1966 he was elected to the Altona Shire Council. When Altona was proclaimed a city on 21 December 1968 by the Governor of Victoria, Sir Rohan Delacombe, Cr Crofts was elected the first mayor. In addition to many council duties, Cr Crofts had been extremely active in the Altona Youth Club, the Seaholme Primary School, the Memorial Park Cemetery and Crematorium, a foundation member of the Western Region Commission and a life governor of Altona District Hospital and Western General Hospital. This biography for Cr Crofts was included in the official program for the opening of the reserve in 1976 and therefore is only part of the story of all his achievements in public life. The Oval 1 at the WLJ Crofts Reserve is the Morris G McDonald Oval named after and recognising one of the founding members of the Altona North Cricket Club. The club originally played at Hatt Reserve in Williamstown Beach and was then known as the Kororoit Stars Cricket Club. In the early 1960’s Morris McDonald facilitated the move from Hatt Reserve (which was a synthetic wicket) to the turf wicket now known as Greenwich Reserve on The Strand. When the club began to struggle for members and players Morris McDonald made the commitment to pay the club’s affiliation fees until they could recruit more players and get back on their feet. Morris lobbied the City of Altona for the club to move to Altona North. In 1972 the club moved to Langshaw Reserve and became known as the Altona North Cricket Club. Morris’s vision was to develop a sporting complex where cricket and football could successfully co-exist on a larger scale. He identified that the Altona North region had the potential for more cricket teams – men’s, women’s and juniors and that they could be all accommodated at the WLJ Crofts Reserve. Source: program for the official opening, photographs and archives from the collection of Altona Laverton Historical Society Inc.